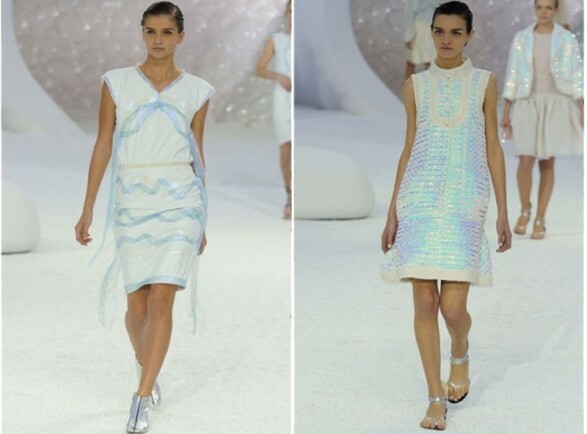 At the Grand Palais Paris Fashion Week is transformed into an immense sea of ​​white milk rich in pearls and iridescent reflections: the scene is the spectacular scenery of Chanel fashion show collection Spring Summer 2012. Karl Lagerfel cleverly mixes subtle geometric graphic elements, silhouette traditional sculptural heads and sought work in a collection that tells the sea, its foam, its shells, its fish and a magical world without time or place. The dominant color is white with tube skirts and short jackets at the waist, ruffles and lace dresses, complete with tweed skirts and pearl twists of the wire balloon. Everything is white, dazzling, bright, pearly or iridescent, Even the costumes are a total and combined with small white trench coat. The models are transformed into wonderful sea creatures where the decorations seem sequin scales, technical fabrics reminiscent of the iridescent shells and ostrich feathers and chiffon, the foam of the sea …. The color palette as well as all shades of pearly and also develop the iridescent pink, blues and black. For the evening silhouettes become more structured, complex: the sleeves cut loose and remind the gills of a fish, the scales are working, while a vertical rise on the figure decorations like seaweed and coral. Even the accessories are still enchanted by the story Karl Lagerfeld laced with silver lame, and clutches bass shaped like a small snail shell.